During a recent redesign of the public pages of user-generated custom t-shirt designs on ClassB, I was faced with a choice: either fix some minor back-end issues with the home-grown commenting system I had written, replace it with a different system, or remove commenting altogether. I did not consider this a very important decision, because so few comments had ever been posted. Because of this, I was leaning toward removing comments altogether. I instead chose to replace it with Facebook Comments, to establish that the commenting system itself has little effect on the quantity or quality of comments. I was certain that the content itself determined whether or not people would comment. I was wrong. On October 12, 2011, I posted the first test comment to the system. That was 150 days ago. During those 150 days, there have been 292 comments posted. For comparison, the equivalent time period a year earlier had just 41 comments posted to the old system. 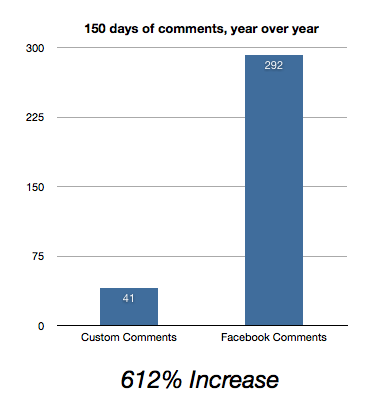 Switching to Facebook commenting increased the quantity of comments by 612%. So, not only did I get moderation tools, swear word filtering, and grammar correction for free, the system itself made it so much easier for people to comment that it dramatically increased participation. Comments also end up being posted in many cases to Facebook users walls, so there is a built-in opportunity to increase awareness of our site and what we offer. I’ve replaced WordPress comments on this blog to see the effects here and will be running similar tests across other sites. What’s your experience been with Facebook comments?